Don’t misinterpret the header – it isn’t the Chief Executive Officer but the Career Enhancement Officer of Times Jobs or at least that is what Times Jobs were gunning for. Alas, it back-fired big time! 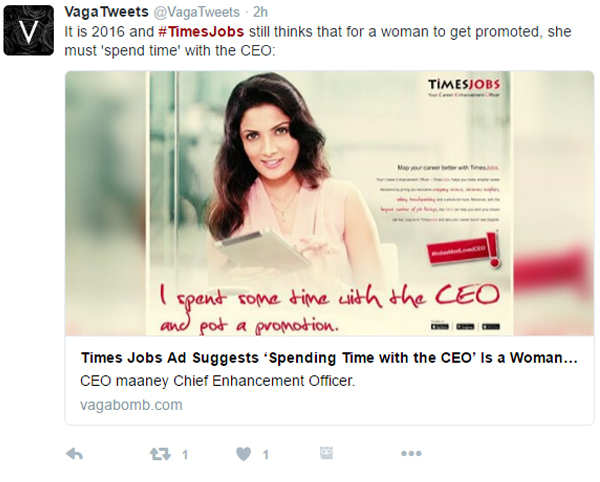 Times Jobs recently rolled an advertisement depicting a woman stating that she had spent some time with the CEO and got a promotion. The advert is a clear case of humorous attempt at advertising gone utterly wrong. The advert has hit just when India has started to exhibit unacceptability to casual sexism and objectifying women in its advertisements. Times Jobs should have thought this one through. The job-portal didn’t just stop at print ads – they also released a nine-second video of the same advertisement and an another one where the woman claims that her CEO is the only one who wants to give her a raise. What a farce! Have something to say on this? Share your views in the comments section below. If you have a news story or tip-off, drop us a line at adnews@brandberrymarcom.com.